More than one-third of the one hundred and sixty or so Hebrew incunabula which have survived were products of the Soncino family. For five generations, its members produced Hebrew books on three continents, from their very first publication (printed in 1483 in Soncino, the Italian town from which the family took its name) to their last (printed in 1562 in Cairo, Egypt)-some two hundred in all. The Soncinos' contribution to Jewish religious life and cultural creativity cannot be overstated, nor can their importance to the development of Hebrew books, the authenticity of their contents, and the quality of their typography, paper, illustrations, and embellishments. The greatest of the Soncinos, and universally acknowledged as the towering figure in the more than five centuries of Hebrew printing, was Gershom Soncino. A wanderer's staff would have been a more appropriate printer's logo than the tower he chose. Political persecution and commercial competition caused him to be on the move constantly, setting up his printing shop successively in Soncino, Casamaggiore, Brescia, Barco, Fano, Pesaro, Ortona, Rimini, and Cesena in Italy; then in Salonica and Constantinople in Turkey, where he died in 15 34. In all, Gershom Soncino printed some one hundred Hebrew books and an equal number in Latin and Italian. His production was not only prodigious but also superb in quality. 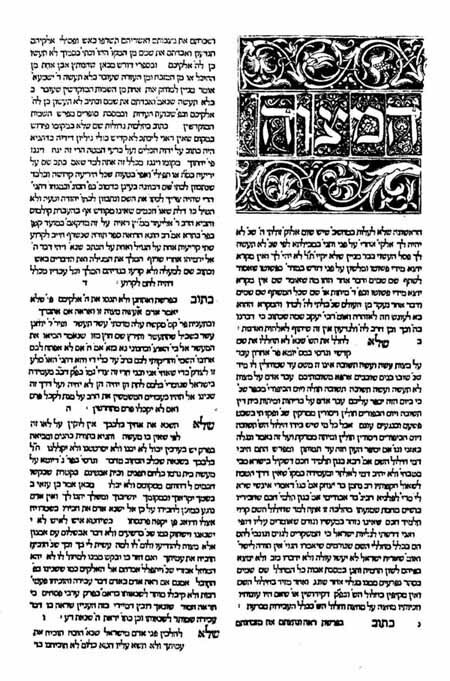 The unique nature of the claim to fame of our second first, the Sefer Mitzvot Gadol of Moses of Coucy, Soncino, 1488, is as solid as it is certain: it is the first book printed by Gershom Soncino. The Library of Congress has two copies of this book and, as if that were not enough, on the end flyleaf of one copy is pasted a bill of sale unique in the annals of early Hebrew printing. 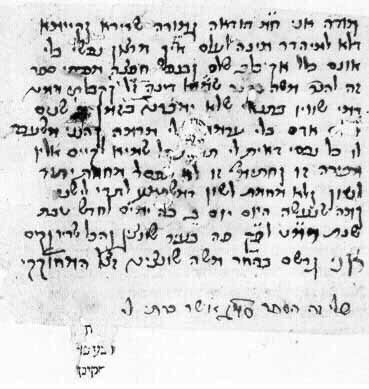 it was written and signed by the seller, "Gershom, the son of Moshe Soncino (of blessed memory), Printer," and issued to one Moshe ben Shmuel Diena, stipulating that the buyer might not resell the volume for a period of two years. The bill of sale is dated "the 25th day of Tevet, (5)249 [ = December 29, 14881, here in the city of Soncino" ten days after the printed date of publication. Arthur Z. Schwarz, who first brought this to the attention of the scholarly world, suggests that this volume may well be one of the first, if not the first off the press. The colophon date is the day of the "completion of the work," i.e., the printing. Some days may have passed before it was ready for distribution. Soncino's signature is his only Hebrew autograph to have survived.